“I’m not surprised at all,” said Guan Han Wen, of Guangzhou in southern China, who thought nothing of dropping a couple thousand dollars to fly to Shanghai, along with his wife and son, to see Tiger play. An interior designer, Guan started golfing six years ago, and his 7-year-old son, Guan Tian Lang, took up the sport at the age of four. In July, Tian Lang placed fourth in the 6-and-under division at the Junior Golf Championships in San Diego. But all anyone had to do was set foot outside the vacuum of Sheshan International Golf Club to realize that even with a 10 year leap, golf in China has a long way to go before it catches on with the masses — most of whom, believe it or not, have never heard the name “Tiger Woods” before. Yao, who lives in a village 30 minutes away from the course, gets paid five dollars a day to work at the club, where a lifetime membership costs $148,000 and furnished villas average $2 million. She’s happy to have the job. Golf, like luxury cars and Luis Vuitton, is now a way for China’s recently rich to enjoy — and project — their newfound affluence. It is also a stark reminder of the huge gap that exists between the haves and have-nots here. Since courses are often built in poor, rural areas, luxury homes can sit across a creek from shantytowns. Two very different worlds collide, and golf maintains its reputation as an elitist sport. In keeping with the theme, tournament passes for the HSBC Champions tournament cost roughly $250. That’s more than the average Shanghainese family makes in a month. 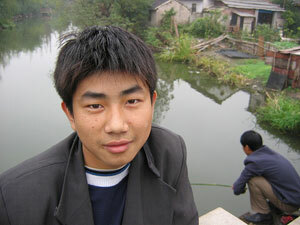 A couple hundred meters beyond Gu, not too far from one of the parking lots for the tournament, 20-year old Yang Gui Lin sat on a small bridge and fished with a bamboo pole. On the left bank of the creek was a new housing development with spacious homes and security cameras every 10 feet or so. 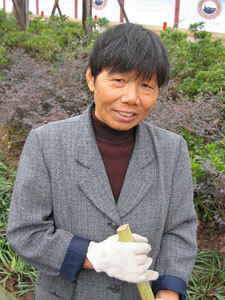 The cameras were pointed toward Yang’s village — a shack, some vegetable gardens and a cluster of graying cement buildings. Yang, a migrant worker from faraway Sichuan province, normally would have been working at a nearby door and window factory, but he and all his coworkers were given two weeks off — unpaid — because of the golf tournament. 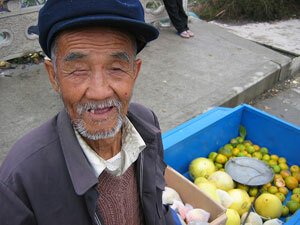 Then, 78-year-old fruit salesman Chen Zi Xue pedaled his wagon by. He had always assumed that only foreigners played golf. Filed under Blog. 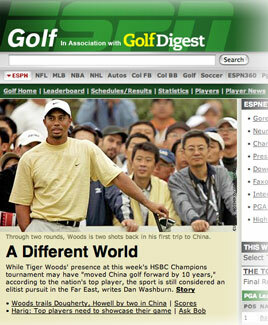 Tagged china, danwashburn, espn.com, golf, hsbcchampions, stories, tigerwoods, tournaments.